An elegant gorilla, for a more civilized age. I've seen a few inventive Odd Paladins run it since the Level Up! nerf. It hasn't performed all that well, but it's cool that it is finally seeing a little play. So I had to include him in my latest deck, the "Inspire Murloc Paladin", which is actually really good! An armored gorilla, riding a barded hippopotamus, wielding a bamboo lance, who tosses bananas to his companions on command. Doesn't get much zanier than that. my favorite card of the expansion, i can always make big value out of it in my hunter decks. This card combined with Murloc Knight and Reinforce for a good time, just mind out for things like Flamestrike. 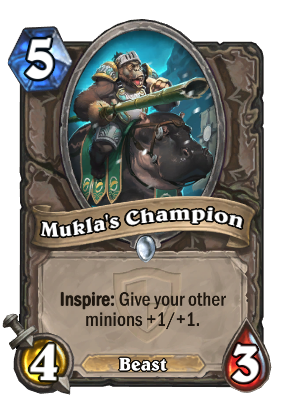 Turn 6 - Murloc Knight + Hero Power and Turn 7 - Mukla's Champion + Hero Power makes this an almost auto-win condition if the opponent isn't able to deal with it quickly. If it continues to survive, you win. Haha. Easily my favourite neutral Beast. This card is devastating with fencing coach..
Looks great in pally arena decks, already won me some games. Kinda strikes me as an Emperor Thaurissan - the opponent's reaction almost always has to be KILL IT KILL IT NOW! or it'll get out of hand. If you spawn a minion off of Hero Power (Paladin/Shaman), does the effect applies AFTER or BEFORE the summon ? A 1/3 Taunt Totem is kinda good I guess.